alaTest has collected and analyzed 38 reviews of Logitech Quickcam PRO. The average rating for this product is 4.2/5, compared to an average rating of 4.0/5 for other products in the same category for all reviews. We analyzed user and expert ratings, product age and more factors. Compared to other products in the same category the Logitech Quickcam PRO is awarded an overall alaScore™ of 71/100 = Good quality. 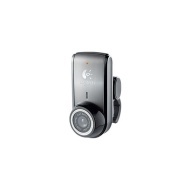 alaTest has collected and analyzed 7 user reviews of Logitech Quickcam PRO from Amazon.co.uk. The average user rating for this product is 4.0/5, compared to an average user rating of 4.0/5 for other products in the same category on Amazon.co.uk. 86% of the reviews on Amazon.co.uk give this product a positive rating. Logitech's latest webcam aims to overcome the web's shortcomings with a resolution of 640x480, but does it succeed? An excellent webcam for the internet enthusiast, but don't expect to be astounded by the quality. not plug and play, you have to install the software first. A bit expensive. I don't know when I will use the 2M pixels in my daily use.